With the first race in the Beer Flight Race Series, Trivium Racing is excited to work with Atwater Brewery and bring our Growler Gallop event to Grand Rapids! In year one, this race will be a 5K race starting and finishing just north of the new Atwater Brewery! 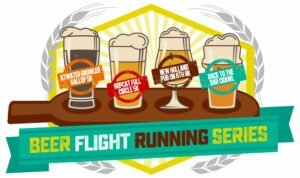 Runners and walkers can expect live music, a unique finishers glass, an awesome, well marked course, an Atwater beer at the finish line, and some amazing prizes! Winners of age groups will get a custom 64oz. growler filled with Atwater beer, while second and third place in each age group will receive a custom 32oz. howler of Atwater beer! Think you have what it takes to win the whole thing? First overall male and female will be taking home a certificate for a KEG of Atwater beer! This promises to be an amazing event and a great way to kick off our Beer Flight Race Series. Each of the four Beer Flight Series events have a different custom finisher’s glass. If you do all four events you will receive a custom paddle to put your glasses on at the end of the year! It has been a privilege of ours to work with Atwater Brewery on 10 events over the last several years and we are extremely excited to get to work with them at their new location in Grand Rapids! Please make sure to support this amazing brewery that really cares about their local communities and their runners! Parking is available on streets and in parking structures around the downtown area. Please leave extra time to find parking and make your way to packet pickup on race day! Access to the after party with live music! This will be a fun, and fast course. This years event will be USATF certified so come on out and race an fast accurate course!